A new report issued today by the National Foundation for Infectious Diseases (NFID) and Pfizer Inc. suggests that an annual preventive care visit or checkup during the teen years provides an important moment and venue for proactive health guidance and intervention. It’s important that teens understand how their behaviors impact health into adulthood, and that we enable adolescents, their parents, and their healthcare professionals to focus on the value of addressing disease prevention at an early age. According to a new report issued today by the National Foundation for Infectious Diseases (NFID) and Pfizer Inc., adolescents are often overlooked in the US healthcare system, which may lead to short- and long-term health consequences and contribute to the economic burden on the healthcare system. The report, titled The Case for Improving Adolescent Health: Helping prepare adolescents for a healthy future, suggests that an annual preventive care visit or checkup during the teen years provides an important moment and venue for proactive health guidance and intervention. The report demonstrates the need for increased attention to adolescent preventive healthcare in the US and emphasizes the role(s) that parents, teens, providers, and adults who influence teens (coaches, youth leaders, school professionals) can play to help make improvements. From the gaps in adolescent-focused programs to the preventive health barriers that exist, The Case for Improving Adolescent Health shows how behaviors and actions may affect teen health. In addition to serving as a checkpoint for modifiable health risk behaviors, annual checkups can help ensure that adolescents are getting recommended health screenings and are immunized according to recommendations. They can also provide an opportunity for confidential health discussions. Modifiable behaviors, such as lack of physical activity, poor nutrition, and tobacco and alcohol use are responsible for much chronic disease. Further, not all adolescents are getting vaccinated as recommended, leaving them potentially vulnerable to vaccine-preventable diseases such as meningococcal meningitis, whooping cough, influenza, and infection with human papillomavirus (HPV). Vaccine-Preventable Diseases: Vaccines administered during the adolescent years can be an important determinant of future health. Four in 10 teens surveyed and just over three in 10 parents surveyed believe that vaccines are not as important for teens as for babies. However, school-aged children have the highest flu infection rates; adolescents 16 to 21 years, along with infants less than one year, have higher rates of meningococcal disease than other age groups; and HPV prevalence is estimated to be as high as 64 percent in adolescent girls. Obesity: Research shows that obese children often become obese adults. Obese adults are then at greater risk for arthritis, sleep apnea, social stigmatization, and discrimination. By the time today’s adolescents reach middle age, the economic burden caused by current rates of overweight adolescents has been simulated to reach $254 billion in direct medical costs and lost wages due to death or lost work time. Risky Behaviors: In a 1997 nationally representative sample survey of adolescent boys and girls, about 75 percent of adolescents reported at least one identified health risk, ranging from abuse to alcohol and drug use, binging and purging, lack of exercise, and high stress. These behaviors, when established during adolescence, may contribute to the leading causes of death, disability, and social problems. Emotional and Mental Health: According to Healthy People 2020 statistics, as of 2010, one in five children in the US had a mental health disorder. At school, a child with depression can have difficulty concentrating, following directions, or completing assignments, and can become socially isolated. In addition to the report, NFID, in collaboration with and with support from Pfizer Inc., conducted a national survey, fielded by Harris Interactive, of more than 2,000 parents of teens, teens, and healthcare professionals. Prior to the survey, NFID convened a roundtable on teen health, inviting key organizations to share their perspectives about barriers to optimal adolescent wellness. 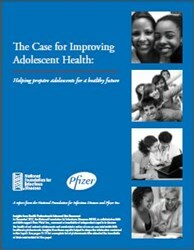 For a full copy of The Case for Improving Adolescent Health: Helping prepare adolescents for a healthy future, visit adolescentvaccination.org/teenhealth. Based in Bethesda, MD, NFID is a non-profit, tax-exempt 501 (c)(3) organization founded in 1973 and dedicated to educating the public and healthcare professionals about the causes, treatment, and prevention of infectious diseases. For additional information, visit nfid.org. At Pfizer, we apply science and our global resources to bring therapies to people that extend and significantly improve their lives. We strive to set the standard for quality, safety and value in the discovery, development and manufacture of health care products. Our global portfolio includes medicines and vaccines as well as many of the world's best-known consumer health care products. Every day, Pfizer colleagues work across developed and emerging markets to advance wellness, prevention, treatments and cures that challenge the most feared diseases of our time. Consistent with our responsibility as one of the world's premier innovative biopharmaceutical companies, we collaborate with health care providers, governments and local communities to support and expand access to reliable, affordable health care around the world. For more than 150 years, Pfizer has worked to make a difference for all who rely on us. To learn more, please visit us at pfizer.com. Harris conducted an online survey of 504 teens aged 13-17, 500 parents of teens aged 13-17, and 1,325 healthcare professionals including pediatricians and primary care physicians (n=510) and nurse practitioners, physician assistants, registered nurses, and licensed practical nurses (n=815) in the United States. All respondents were sampled from the online panels maintained by Harris Interactive Inc. and its partners, invited by e-mail to be screened, and if qualified, participate in an online self-administered survey. Data was collected between December 27, 2012 and January 23, 2013. Data for all three surveys (teens survey, parents survey, and healthcare professional survey) were weighted. Harris Interactive is one of the world's leading market research firms, leveraging research, technology, and business acumen to transform relevant insight into actionable foresight. Known widely for the Harris Poll® and for pioneering innovative research methodologies, Harris offers proprietary solutions in the areas of market and customer insight, corporate brand and reputation strategy, and marketing, advertising, public relations and communications research. Harris possesses expertise in a wide range of industries including healthcare, technology, public affairs, energy, telecommunications, financial services, insurance, media, retail, restaurant, and consumer package goods. Additionally, Harris has a portfolio of multi-client offerings that complement our custom solutions while maximizing our client's research investment. Serving clients in more than 196 countries and territories through our North American and European offices, Harris specializes in delivering research solutions that help us—and our clients—stay ahead of what's next. For additional information, visit harrisinteractive.com.